In the five days since I wrote about my husband’s experience in hospital, I have heard from over one hundred people who have had similar experiences, either personally or with a family member. You can read about some of their experiences in the comments related to my previous post, as well as on my facebook page. I also received many emails, as did my husband who sent the blog out to a number of his friends. As I read through many of these accounts of bad food, dirty surroundings and a lack of privacy, I recalled reading the biography of Florence Nightingale when I was 9 years old. 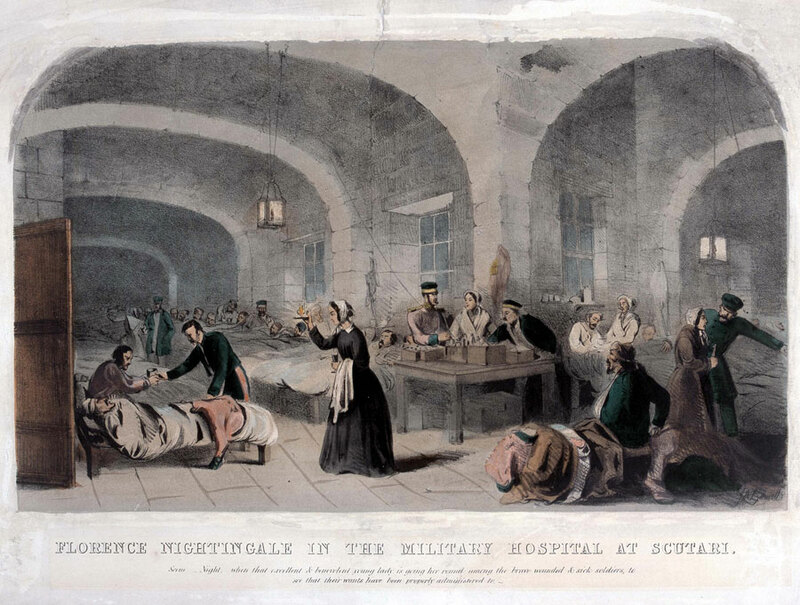 While I am not saying the hospital conditions in Ontario today are equivalent to those at the military hospital in Scutari in the nineteenth century, I vividly recalled from that biography that patients in Victorian England dreaded going to hospital because the conditions were worse than the poorhouse. I found myself wondering if our hospital services had reached the point where we were going backwards – back to a time when people did anything not to be admitted to hospital. Read through a few of the comments to my last post and you’ll see that some people are saying just that, that they will do anything to avoid hospitalization. The question for me, after reading so many insightful comments is: What can ordinary Ontarians – and most of the people commenting were Ontarians – do to help hospitals improve the level of care they provide? What should they request when they lobby or write to politicians? How can they be helpful after a hospitalization, either their own or a family member’s? Some of those Ontarians who expressed concern were physicians. There is one thing that many physicians can do to improve hospital care if they work in hospitals and that is to be as vigilant as possible about their medical staff meetings and opportunities. I met with Dr. Chris Carruthers a month or so ago. He reminded me that doctors have a lot of influence via their positions on hospital committees and boards but that they often do not bother to attend those meetings or committees. This is something we could change. The physicians and nurses who attend Board and Committee meetings have a unique opportunity to put forward the patients’ and their own point of view. As a Clinical Director, I ask my patients and their families to fill out my hospital’s surveys, including their impressions of our brand new building. Patient concerns are taken very seriously. I believe that if every patient concerned about the quality of hospital food mentioned it on a survey, change would begin to happen. That is one example but change related to patient experience is necessary in many aspects of hospital life. An important element in a facility is atmosphere. About one year ago, I moved to an office that was big enough for me to complete my assessments in it. A number of my patients mentioned how much better they like my office than the interview room. They told me that they feel more welcome when they are able to see me in my office. Their comments make me want to do something to make the interview rooms more homey but hospitals have fairly rigid rules about what can be put on the walls in common spaces. I wonder if that’s a completely good thing. Not wanting to be in hospital is normal but I am still concerned that my last article raised so much negative feedback about the physical attributes of hospital care. With so many people taking time to write about their experiences, I wanted to provide even a couple of small things we could do to improve our hospitals. We can do this. Please let us all know what you would do to improve hospitals. If there is enough interest, it might even be worth having a tweetchat to generate interest and raise awareness with respect to the problem. Finally, thank you to everyone who read my article and took the time to let me know their experiences. I have learned so much from all of you. I am sitting next to my mother’s bedside in hospital as I write this. She was in the Emergency Department for 36 hours after a PSVT, and is now on a unit still waiting for stress test etc.. The ER was extremely chaotic and stressful, quite similar to the picture you show here. The staff were very disgruntled and vocal about it, adding stress to the situation. It was also very dirty leaving me worried that she would acquire something she hadn’t arrived with. One nurse didn’t have a break or a chance to eat all day. She was quite stoic about it but I insisted on getting her teas and muffins. We need to take far better care of our health care providers, and in turn they will have the mental, emotional and physical energy to take better care of us. I don’t have immediate solutions but I do think urgent care centres were a good idea to take the load off — we needed more of them and public education to use them effectively. Your comments will be so welcome to many health care providers, especially given the personal stress you must be experiencing right now. It is so difficult to have a member of your family unwell. It is difficult for them and for those who care for them. Everyone in healthcare realizes this and tries to do their best, but we are all so grateful when some one notices, as you have. I’m thinking of you and your mother and hoping everything will work out for the best. Thank you for your very kind words. Thank you for this most important topic and getting the discussions going. I our area (Quinte) we have a current battle on – to keep our branch hospitals open, save lives and serving the patients not the local LHIN and Hospital Board. As a doctor who has only been in the Ontario system for 3 years (previously New Zealand for 20 years and before that England) what strikes me is how hospital centred medical care is in Ontario. Every hospital is a little Empire with almost no community care or attention to community needs. Hospitals are an old fashioned way of delivering health care designed for when most illnesses were acute. They are not that good at managing repeat crises in chronic illnesses. Being more involved in hospital governance seems to me a bit like rearranging the deckchairs on the Titanic…. Physicians in Ontario are fortunate to have positions on hospital boards and committees . They need to use this opportunity to be much more proactive in improving the quality of patient care. They need to understand how boards work and influence decision making to improve care. We as physicians can make a significant difference particularly if we are more provincially co-ordinated on important quality issues to champion at board meetings. Being a hospital board director is a powerful opportunity to influence health care in Ontario. Physician board members need to do more. Thank you for starting this discussion. I find that my patients do go to extremes to avoid ER and admission. I agree that we need to reestablish our physician leadership in the running of the medical system. We need to step up and own our profession again in all aspects. I put an article on twitter that reviewed hospitals under MD leadership and those under business administration. The MD hospitals had higher quality outcomes. Thank you for your comment, Cathy. Is there a link to your article that we could attach here? I’m sure others will be interested in it.